DANBURY, Conn. — The global pharmaceutical market is expected to grow at a slower rate over the next five years, according to a new report released Tuesday from IQVIA. Global spending on medicine reached $1.2 trillion in 2018, according to the report, and by 2023, that number could exceed $1.5 trillion. Yet while the pharma market has grown about 6% annually over the past five years, that pace will slow to 3% to 6% annual growth, IQVIA predicted. A number of forces are causing this slowdown, including U.S. regulation on drug pricing, loss of exclusivity for blockbuster drugs, and the growing biosimilar market. With lawmakers and the public focused on lowering drug prices, drug companies are scaling back price increases. Net prices increased at an estimated 1.5% in 2018, according to IQVIA, and they are expected to rise by up to 3% over the next five years. The price increases are also expected to be low. This month, several drugmakers resumed price hikes after temporary freezes last year, but many were only modest increases. On average, list price increases are below 6% per year, according to the report. Over the next five years, the average annual increase is expected to stay within the 4%-to-7% range, IQVIA predicted. The report also forecasted that launch prices for drugs will go down, due to greater competition for innovative brands, the effect of price transparency initiatives, and fewer major breakthrough medicines in the next five years. Treatments’ loss of exclusivity will also have a major effect on the U.S. pharma market. Globally, the impact of loss of exclusivity could reach $121 billion between 2019 and 2023, but 80% of this will be in the U.S. market, which accounts for $95 billion. 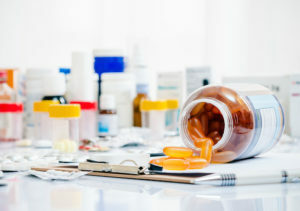 By 2023, 18 of the top 20 branded drugs will face generic or biosimilar competition, and the biosimilar market is expected to be three times larger than today’s, according to the report. A notable example is AbbVie’s blockbuster Humira, which will lose its U.S. patent in 2023. The growing biosimilar market also means less spending, due to competition and the overall lower price of biosimilars. As it continues to grow, global pharma spending will see a loss of $160 billion, compared to spending if there were no biosimilars. Despite the slowdown in spending, the number of product launches is expected to grow, from 46 to 54 annually through 2023, according to the report. The average spending in developed markets on new brands is expected to rise slightly to $45.8 billion in the next five years, but represent a smaller share of brand spending. IQVIA attributed this increase to larger R&D pipelines and historically high success rates for new drugs. Along with more biosimilars, the share of drugs that are specialty or orphan drugs will continue to grow. Two-thirds of product launches over the next five years are expected to be specialty drugs, up slightly from 61% over the past five years. By 2023, specialty products will make up about half of spending in most markets, according to the report. The IQVIA Institute for Human Data Science is the research division of IQVIA, a healthcare company that provides analytics and technology platforms and research services to the pharma industry.